How to Measure for a Ramp? To know about measuring terminologies and to find out the correct measurements is very important before buying a wheelchair ramp. A correctly measured ramp is must for a safe and secure transfer across the ramp. 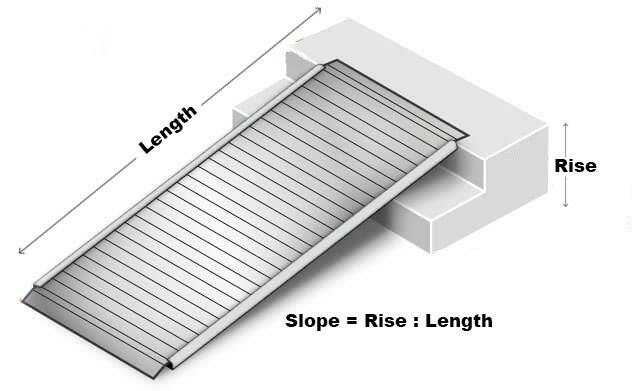 Length - The specified length of a ramp or a section of a ramp. Rise - The vertical distance from the ground to the top step or landing where you want the top of your ramp to be. Slope - The inclination or steepness of the ramp. It shows the relationship between the rise and the length of the ramp. Typically, Americans With Disabilities Act (ADA) recommends 1:12 ratio or 5-degrees as the standard ramp slope for wheelchair. It means that for every 1 inch of rise, 12 inches of ramp is required. 5-degrees (1:12) - ADA compliant for loading unoccupied wheelchairs or scooters. Recommended for public and commercial properties. 1 inch rise per 12 inch ramp length is equals to 5 degrees. 7-degrees (1:8) - Recommended for manual wheelchairs with independent user or limited strength attendant. 10-degrees - Recommended for manual wheelchairs with strong assistance. 12-degrees - Recommended for manual wheelchairs with strong assistance, power wheelchairs, and scooters. 15-degrees - Recommended for restricted space and unoccupied loading or unloading. Not practical for home use. First choose the ramp slope according to your personal requirements. Then measure the total rise from the lower level to the upper level and divide it by the slope to get the ramp length. Standard unit for rise distance is inches and for ramp length, is foot. For example - For a rise of 12" (1 foot) and a required slope of 7 degrees, 12/1.5 = 8 foot ramp. How to Measure for a Wheelchair? Wheelchairs come in a variety of dimensions and choosing the one that best suits your requirements is crucial. Firstly, identify the doorways, elevators, passage ways, or whatever that you think can be a part of your routine. Then take your body measurements. According to your measurements and surrounding requirements, choose wheelchair measurements that will fit you as well as your surroundings. A. Seat Depth - For wheelchair seat depth, measure from the rearest point of the wheelchair seat to the front of the seat. Subtract at least two inches because it is wise to leave approximately a 2-3 finger space between the front of the seat and the back of your knee. B. Back Height - Measure from the seat base to the top of the wheelchair back. It depends on how much upper back support is required. The correct backrest height maintains a good posture and allows the permitted freedom of movement. C. Rear Seat-to-Floor Height - This measurement starts from the ground and moves up to the edge of the rear seat. It is relative to the front seat-to-floor measurement and determines rearward slope of the wheelchair seat. A lower rear seat height as compared to the front seat height buckets up the user. D. Hanger Angle - It is measured from the horizontal and determines how far the footrest stretches away from the wheelchair. A tighter angle will increase the flexibility of the wheelchair to turn around in limited space. E. Seat Width - It is the distance between the two armrests. It must be wide enough to ensure proper weight distribution, but narrow enough for easy maneuverability of the wheelchair. F. Wheel Camber - It is the degree of angle on the rear wheels. This involves measuring the wheel’s angle corresponding to the vertical. More camber means improved stability and smoothness but also means restricted access through narrow spaces. G. Front Seat-to-Floor Height - Measure from the front edge of the seat canvas straight down to the floor. Minus the cushion’s thickness, when compressed, from it. If the wheelchair is not foot-propelled then add a minimum of two inches for the foot-rest clearance. H. Footrest Width - It is the distance between the inner side of each leg-rest. I. Center of Gravity - Measure distance between the front of the seat back post and the center of rear axle. The larger measurement makes the wheelchair quick to maneuver but requires a good balance. J. Overall Length of Rigging - Measure distance from the front edge of the seat upholstery to the top rear of footrest. It is also known as the knee to heel length. K. Backrest Angle - Measure angle of the back post to the floor. Ninety degrees will be perpendicular to the floor. To determine angle from the back post to the seat, minus two degrees for every 0.5" of dump. All the measurements are to be taken while sitting on a flat, firm surface in the correct posture. For the required seat width, measure the widest point of the body from knee to hip. Keep in mind bulky clothing and add an inch for easy movements. For hanger angle, measure how far you want your toes to stretch away from the body. Required length of rigging can be measured from the back of your knee to the bottom of the sole of the shoe. Use a hard measuring tape or calipers for taking measurements. Avoid using a tape that bends or wraps around the body. All measurements are to be taken straight across the body. You can note down the measurements to avoid any kind of confusion or errors. How to Measure for a Lift Chair? Weight Capacity - All lift chairs are marked with a specific weight capacity. It is their load bearing capacity. According to your weight, you will have to choose a wheelchair that can lift you safely. It is recommended not to exceed these limits. Seat to Floor Height - The seat to floor height is measured from the top of the seat to the floor. It should be such that you can place your feet comfortably on the floor while sitting on the chair. If the seat to floor height is too tall, your feet will hang above the floor. Seat Depth - The seat depth is measured from the most rear point of the lift chair seat to the front of the seat. It should not be too long or too small because an extra long seat depth will make you squirm whereas an extra small seat depth will not give proper thigh support. Seat Width - It is measured from one armrest of the lift chair to the another. It should be properly measured because too wide a seat width can cause posture problems whereas too small a width can squeeze you in a restrictive area. Back Height - It is measured from the back of the seat cushion to the top of the backrest. It should be tall enough to accommodate your back properly. All the measurements should be taken while sitting on a chair. Dining chairs work best for this purpose. Weight Capacity - One of the most important considerations while choosing a lift chair is your weight. Measure your weight and choose a chair that can carry you safely. Be sure to be within the recommended range for the best comfort and long-term reliability. Seat to Floor Height - It is measured from the floor straight up to the back of your knee where it bends. Make sure you measure this distance properly to place your feet comfortably on the floor. Seat Depth - To measure yourself for the seat depth, take the scale and measure from the back of the hip to the back of your knees. It should be measured properly for a comfortable seating position. Seat Width - Measure across the widest part of your lap from hip to knee in a straight line. Add an inch or two for comfortable and easy movements. Back Height - To determine the back height, measure from the bottom of your hips to the top of your head. It totally depends on your specific requirements. Compare these measurements to the specifications of various lift chairs to find a perfect chair for you.